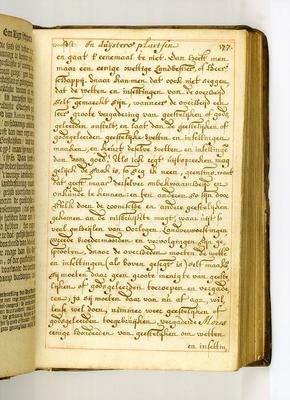 In 1668 the Amsterdam physician Adriaan Koerbagh published the only dictionary that was ever prohibited in the Netherlands. Why did Een Bloemhof van allerley lieflijkheyd [A flower garden of all sorts of delights] cause such offence? On account of the definitions which Koerbagh, a follower of Spinoza, gave to theological concepts. Een Bloemhof was seized and burnt. The Amsterdam bailiff demanded that Koerbagh’s tongue should be pierced with a red-hot awl, that his right thumb should be chopped off and that he should be imprisoned for thirty years. Koerbagh fled to Culemborg, at the time a legally autonomous town, where he began writing a new book: Een ligt schijnende in Duystere Plaatsen [A light shining in dark places]. In this work he once more systematically expounded his philosophical and religious views. When the printer discovered who he was dealing with, he handed the manuscript, which had only been printed in part, to the Amsterdam bailiff. The latter departed for Culemborg to force the governor to hand over Koerbagh, but it turned out that the bird had flown. Disguised in a black wig Koerbagh managed to hide himself in Leiden for some time under the name Pieter Wilte, but he was betrayed, arrested in his bed and transported to Amsterdam with his feet chained (pede ligato). There he was imprisoned in the so-called ‘Rasphuis’ jail, where he had to rasp hardwood. Before long Koerbagh died of exhaustion, at 37 years old. Well over a hundred and fifty years later, in 1822, Baron van Westreenen bought this copy of the small volume for one guilder. The text has been printed up to page 176, the remainder – up to page 454 – has been supplemented in manuscript. Two years later Van Westreenen bought another, similar copy. As far as it is known, these are the only copies to have survived.